6x10 Wicker Antique Brass Floor Register Discounts Apply ! Replace your outdated 6 x 10 floor registers with these decorative wicker registers. Our metal air vents have an effortless installation process; simply drop them into the hole in your floor. This 6 x 10 floor register allows you to adjust the airflow by opening or closing the damper. The metal air vent is built with a plastic damper which will prevent it from rusting. This wicker 6 x 10 floor register is also finished in a unique lacquer coating which protects the antique brass finish from discoloring or corroding. Furthermore, these metal air vents are manufactured to withstand up to 200 pounds because they have a sturdy steel core. ***Hint: Industry standards for measuring a 6 x 10 floor register requires you to measure the actual hole opening in the floor. Make sure you are not measuring the existing metal air vent cover when trying to find the appropriate size. This register will fit your 6 x 10 floor opening. 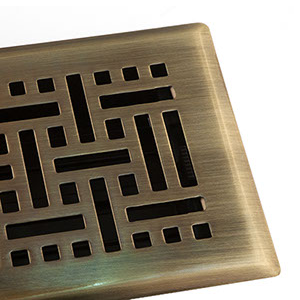 These decorative metal air vents come in countless sizes and also several finishes. 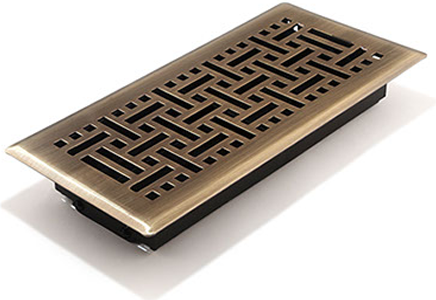 Spruce up your 6 x 10 floor register today with this stylish decorative vent.